Five Poems about Teachers is for children up to the age of eleven, and their teachers. 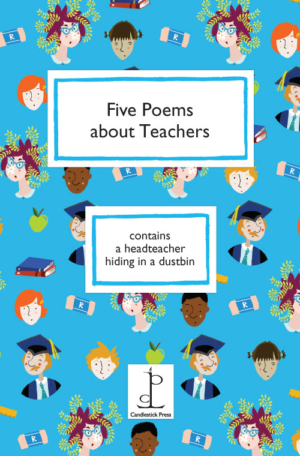 This hilarious mini-anthology includes poems about a headteacher in a dustbin, another teacher tearing out her hair, and one who doesn’t seem to understand that watching the snow fall outside the schoolroom window is so much more interesting than learning one’s times tables… A must for any child – and any teacher! – with a sense of humour. Includes poems by Allan Ahlberg, John Hegley, Kit Wright and Annette Wynne. Colour illustrations throughout by Amy Blackwell.